On leaving the Market Square and going down Castle Street we immediately see Ye Olde George Inn on the left hand side. (see previous page on Site of Old Market Square for physical location). This building, according to its deeds, was a dwelling house dating from the 15th century. 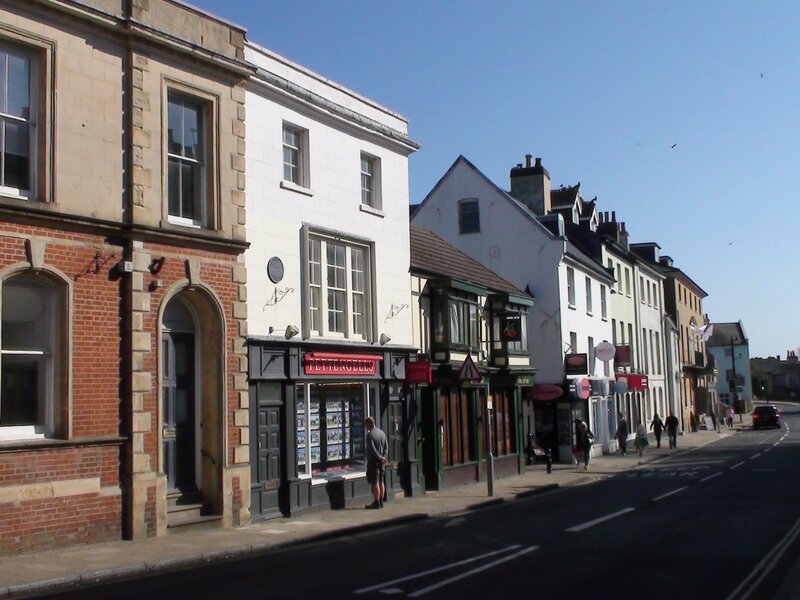 There were at least three other inns within a stone’s throw of the Market Square. The public house opposite ‘The George’ was originally the St. George and Dragon, a coaching inn which existed in 1652. Here the Emerald Coach from Lymington to Poole would change horses. Next to Ye Olde George Inn is Lloyds Bank which has a brick skin concealing three wooden medieval structures. Lloyds was once, in 1685, the White Hart Inn. 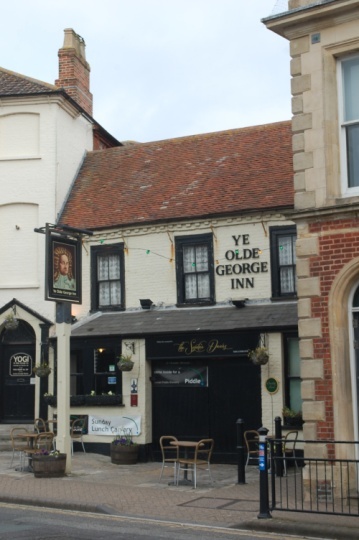 Between Lloyds and Ye olde George Inn is the narrow Drum Alley which links the Market Place to Ducking Stool Lane. 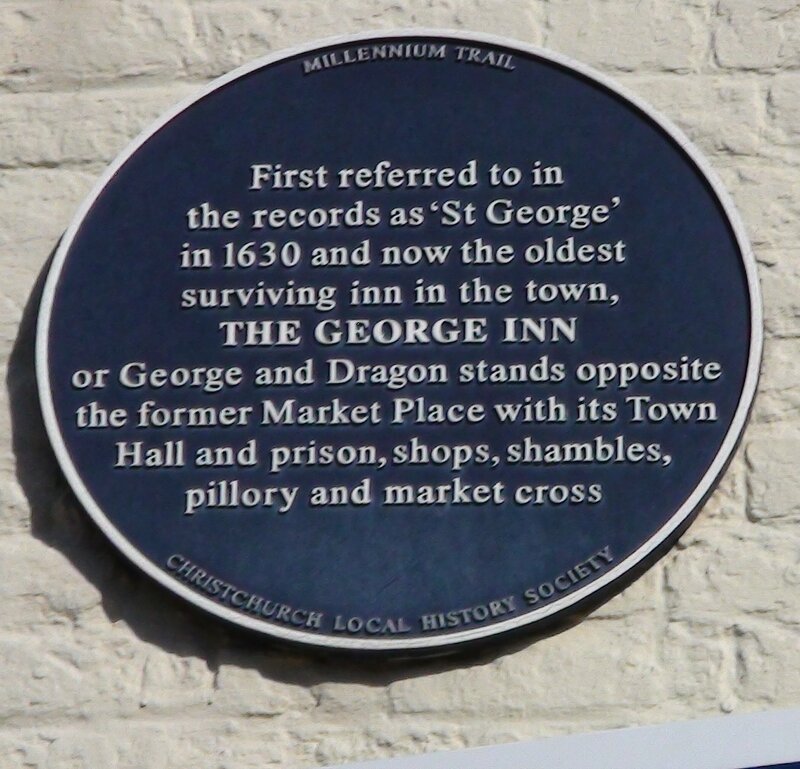 On the Christchurch Blue Plaques Millennium Trail Leaflet1 this location is identified as number 11. Slight further down Castle Street, also on the left hand side, is 6 / 6a Castle Street, now occupied by Pettingell’s Estate Agents. (see previous page on Site of Old Market Square for physical location). Originally a house built for a wealthy mercer, a dealer in fine fabrics. It passed into the hands of the Ferrey family, one of whom, Benjamin senior left his diary jottings on the 18th century wainscot paneling to be discovered in a recent restoration. Benjamin Ferrey junior was an architect of quite brilliant repute winner of the Gold Medal from the Royal Institute of British Architects, his last design was Bagshot Park, commissioned by none other than Queen Victoria herself and a royal home today. Also Benjamin Ferrey designed Osborne House on the Isle of Wight for Queen Victoria, he also wrote the first book on Christchurch Priory in 1834. On the Christchurch Blue Plaques Millennium Trail Leaflet1 this location is identified as number 12. Further down Castle Street but on the right hand side is the New Forest Perfumery and Tea Rooms. (see previous page on Site of Old Market Square for physical location). The pretty carved facade dates from the Victorian period when it was long used as a butcher’s shop; the meat hooks racks can still be seen above the window The building originally a dwelling house has been owned by the Borough for nearly 600 years. During the Civil War the tenants had their annual rent reduced from £1 4s 0d to just £1 0s 0d because their garden was made smaller by the castle moat being recut. 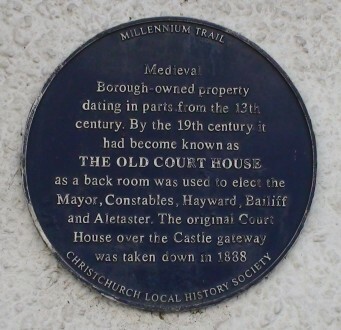 The Court Leet met in the now demolished Castle Gate House and also used a back room at the Perfumery. 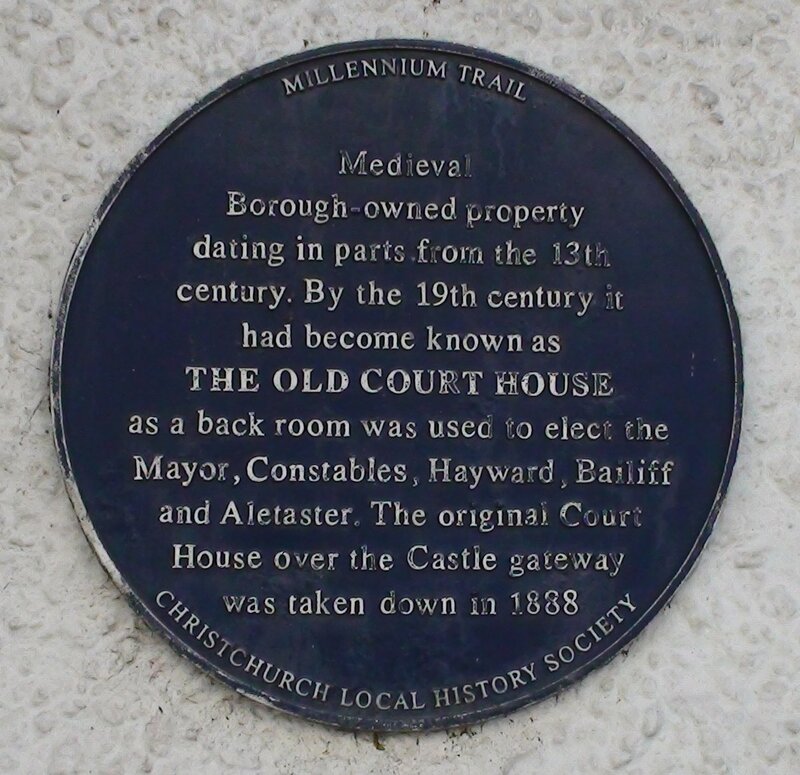 On the Christchurch Blue Plaques Millennium Trail Leaflet1 this location is identified as number 13. From the third picture on this page you can see in the distance on the left hand side The Kings Arms and the Town Bridge. 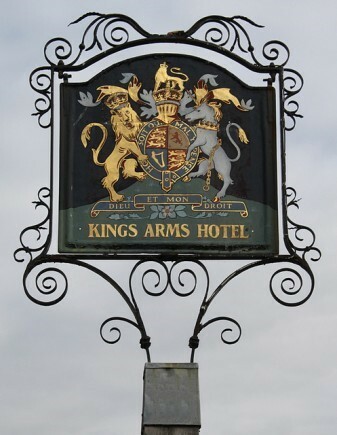 The Kings Arms dates from 1801 (see previous page on Site of Old Market Square for physical location). and was built by George Rose of Christchurch who was Member of Parliament for the Town between 1796 and 1818. It was built on the site of the Old Kings Arms Inn which had stood for about one hundred years. The Hotel opened in 1802 and was known as Humby’s after the first landlord, one Thomas Humby. He shared the running of the Hotel with his wife Miriam. When Thomas died in 1820 Miriam took over the business. Their son Walter William Humby also went into the hotel trade and opened the Sandford Hotel in Mudeford in 1835. At this time Mudeford was an exclusive resort for the rich and famous. King George III, who was a close friend of George Rose, had visited Mudeford and his daughter Princess Caroline had stayed at Sandhills, his marine villa. With such elevated connections when Walter opened his hotel in Mudeford there was probably a strong body of opinion that wanted the name Mudeford changed to the more pleasant sounding Sandford! 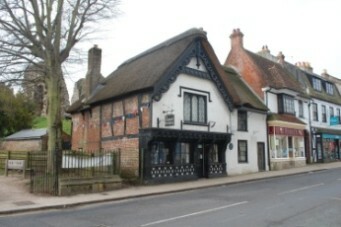 Humby’s Hotel would have been the obvious venue in which to hold the social gatherings for these aristocratic visitors and so it became the venue for fashionable balls in which the wealthy visitors to Georgian Mudeford, then a famous ‘watering-place’, loved to indulge. 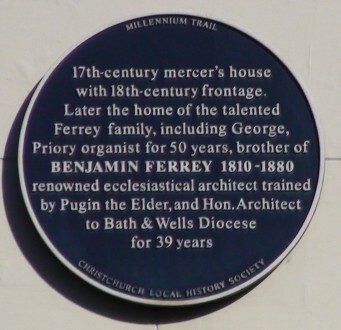 In 1837 Miriam died and her son Walter William Humby returned to Christchurch to take over the family hotel. Walter Humby was made Mayor in 1847 and no doubt his establishment was the place for all official functions. On January 24th 1856 The Kings Arms was the venue for a celebratory luncheon in honour of Admiral Sir Edmund Lyons, a famous son of Christchurch. Lyons had been born in Burton and had risen to command the Black Sea fleet during the Crimean War. Walter Humby ran The Kings Arms for twenty years but by 1857 he had decided to sell and the Hotel was bought by Nicholas Newlyn. Walter Humby did not enjoy a long retirement and he died in 1858. Not surprisingly the Hotel now became known as Newlyn’s. Nicholas Newlyn was also Mayor of Christchurch in 1873 and 1874. The Hotel continued as the premier entertainment establishment for official and social functions in the Town, a role which it continues to enjoy. On the Christchurch Blue Plaques Millennium Trail Leaflet1 this location is identified as number 15, but there is no plaque erected. The tour continues by joining the path by the side of the Mill Stream to the East of Constable’s House.